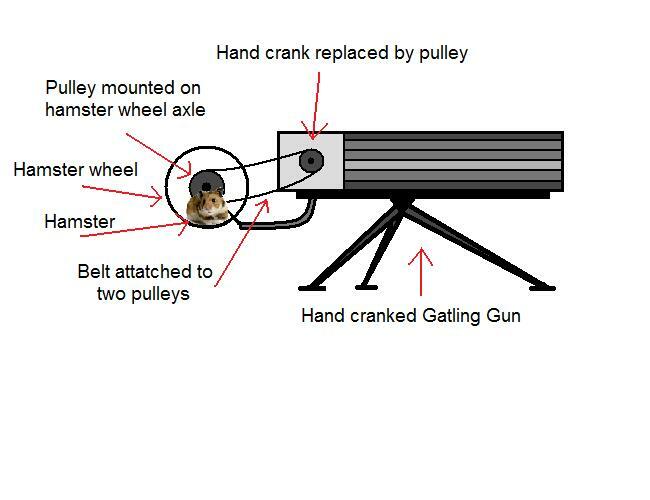 Many hamster* wheels geared together to drive a gatling gun. Needs extra small hearing protectors. Issues to be resolved are logistics of lettuce leaves and shredded paper to the front line, and a NATO standard sunflower seed. The last thing you want to happen is many bullets, but the sunflower seeds jam. Small uniforms also needed to fit in with the Geneva Convention. Clarification on Russian field mouse to NATO hamster exchange ratio. *No relation to Abu Hamsta, late of Jordan **. ** Yes, I am really this bored. With lessor hearing protection there would a nice feedback loop for gun speed especially if they are new recruits. If both side employ this, the only people likely to get hurt would hamster owners/trainers/feeders and gun repositioners. Of course the hamsters would writing sad letters home, and taking that last trip in a shoe-box. Is it legal to draft a hamster ?